Checked out a little house with a private bay not too far from Hammerdal (Jämtland County) today. Huge windows on both floors overlooking the bay. Very private. I guess we saw a dozen cars all in all with people that wanted to check it out. I like these little trips, one of these days I will find the perfect spot. Things change and my Sign is not Cancer anymore. Apparently I am a Gemini now, and this will take some time to get used to. I do feel sorry for you people that are of the new Ophiuchus Sign though, that might not work at all in a conversation at the pub in the foreseeable future. It will take years for this to settle down. This is good news. Toto has just released a concert recorded in Switzerland 25 years ago called “Live At Montreux 1991”. Now this was a great tour and they did perform the super heavy “Kingdom of Desire” on that trek, which is going to be great to see/hear again (I´m buying both the DVD and CD formats). I have good memories from this tour, I hanged out with Steve Lukather and I even gave him contact information to Tony Carey that year, thinking he may fit Toto well (they had problems with lead singers at that time). I published issue 3 of DEEP PURPLE FOREVER back in September 1991, so it has been 25 years now. Fantastic cover shot of Ian Gillan by photographer Michael Johansson. Part of me miss those days, we didn´t even know how lucky we were did we? Word has reached me today that artist Jack Davis passed away on July 24. He was 91. I grew up with his cartoons, all the great MAD covers etc. I mean, the guy was way up there. Classic stuff. OK, the wait was pretty long for the second book in this series as the first came out way back in 2005. Still, if you wait for something good… “Svensk Seriehistoria – andra boken från Svenskt Seriearkiv” (Seriefrämjandet, 2016) takes a look at the 1960s and that, of course, is right up my alley. 324 pages. Well here we are then – model manufacturer Roden has issued a series of boxes in what they call their Music Series and these includes the legendary aircrafts that were used by Deep Purple and Led Zeppelin in the mid 1970s – “The Starship” and “Caesar´s Chariot”. The boxes alone are likely to make collectors of both bands very happy. The scale is in 1/144 and they are not that expensive if you want to add them to your collection. The Starship was the first Boing 720 that was built back in 1960. It was purchased from United Airlines in 1973 by Contemporary Entertainment and was remade into a luxury aircraft for rich clients who wanted to travel in style. Led Zeppelin used The Starship in 1973 and 1975, Deep Purple in 1974 and other clients included Frank Sinatra, Elton John, The Allman Brothers and Peter Frampton. In 1977, it was grounded and Led Zeppelin had to find an alternative. 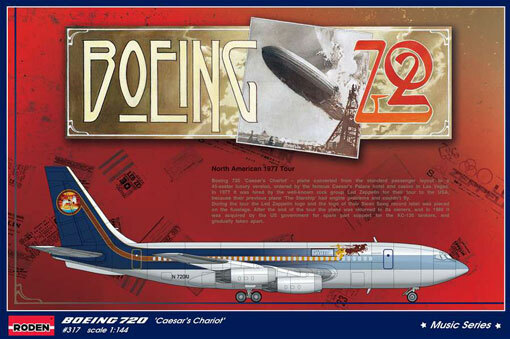 They went for a Boeing 707 called Caesar´s Chariot that was owned by Caesar´s Palace. In rock folklore, it was mainly Zeppelin and Purple that became famous for using these aircrafts, and it was part of the excess of the era. 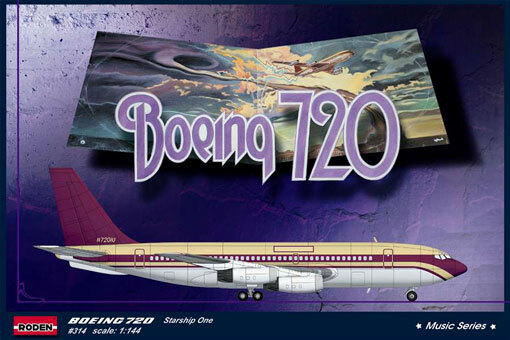 The fact that a model company has come up with the idea to reproduce what these planes looked like when they were hired by Deep Purple and Led Zeppelin is a testament in itself of the reputation this produced in wide circles in the mid 1970s. Modellers will be able to create exactly what they have seen on film and on many pictures. Fans may in fact just enjoy the very boxes since they look great. As a major fan of Purple (and I like Zeppelin too, I will buy both boxes) I can say that I was glad to see that somebody had taken a shot at recreating these classic aircrafts. Full cred to Roden for this. 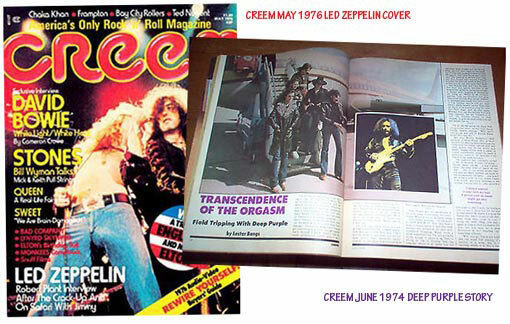 Once fans of these epic bands realize that these boxes exist, and I don´t think they do know at this point (I know for sure that this is still news on the Purple side and I think it would have spread fast to us from Zeppelin blogs had they known about it), I think the manufacturer may see a flood of orders. Fans may have to act quickly as word gets out, I certainly did. In fact, fans in Sweden will be able to purchase these from Bromma Hobby in the near future since I have been in touch with this excellent store about this. Meanwhile, you guys need to scramble now to secure your boxes.